This brochure is published within the framework of the Scheme for the Application of International Standards for Fruit and Vegetables established by OECD in 1962. 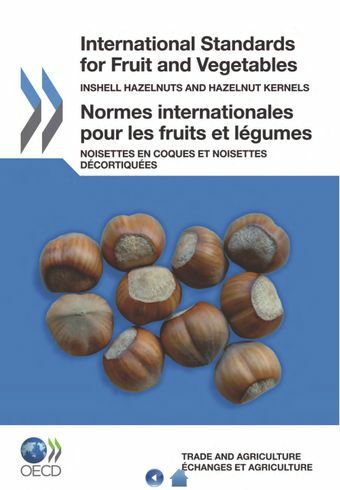 It comprises explanatory notes and illustrations to facilitate the uniform interpretation of the current Inshell Hazelnuts and Hazelnut Kernels standard. This brochure illustrates the standard text on Inshell Hazelnuts and Hazelnut Kernels. It demonstrates the quality parameters on high quality photographs. Thus it is a valuable tool for the inspection authorities, professional bodies and traders interested in international trade in Inshell Hazelnuts and Hazelnut Kernels. The brochure also includes a USB key containing the electronic version of the publication.